The ’85-’86 Hartford Whalers held a 3-2 series lead before the ’12-’13 Columbus Blue Jackets took Game 6 and ended the series in an epic, four overtime Game 7. The Whalers were able to send Game 7 into overtime with a 3rd period goal from Stew Gavin. 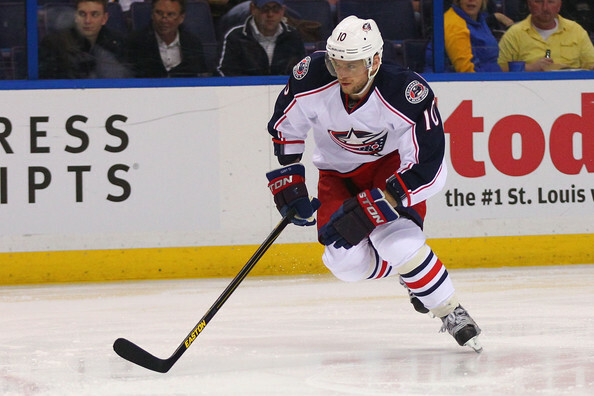 However, Marian Gaborik ultimately ended the series with his goal in the fourth overtime. This series was a bit of a weird one. Based on the statistics, the Whalers should’ve won this series. They averaged more goals and shots on goal per game and their starting goalie posted a better save percentage, but the Blue Jackets are the ones moving on partially due to their advantage in special teams. Surprisingly, a forward known for racking up PIM’s and not points led the Whalers offensively. 14-year NHLer Dean Evason notched four goals and eight assists, but he was beaten in total points by teammate Ray Ferraro who totaled 13 points (6 G 7 A). Defenseman Dave Babych and forwards Stew Gavin and John Anderson also reached double digits in points, scoring 12, 11 and 10 respectively. Goaltender Mike Liut had ups and downs throughout the series and finished with a 3.57 GAA and a .916 SV%. Game 7 hero Gaborik was the leading goal scorer for the Jackets in the series with six and he also tallied three assists for nine total points. The leading point scorer for Columbus was center Mark Letestu with five goals and seven assists for 12 points. Letestu was the only player on his team to reach double digits in points. Defenseman Jack Johnson also pitched in offensively with two goals and five assists for seven points, but posted one of the worst plus/minutes ratings of -8. Sergei Bobrovsky, better known as “Bob,” did not have too good of a series overall, but did shine in a couple of games. He finished with a 4.71 GAA and a .891 SV%. Now that Columbus has registered the first upset of the tournament, they move on to face the ’73-’74 Boston Bruins in the 2nd Round. Up next in the 1st Round is a matchup between the 20th-seeded ’02-’03 Dallas Stars and the 45th-seeded ’76-’77 Cleveland Barons. This entry was posted in 1st Round, Ultimate NHL Playoff and tagged 1st Round, Columbus Blue Jackets, Dave Babych, Dean Evason, Derick Brassard, Hartford Whalers, Jack Johnson, John Anderson, Marian Gaborik, Mark Letestu, Ray Ferraro, Sergei Bobrovsky, Stew Gavin, Ultimate NHL Playoff. Bookmark the permalink.